Though I'm not likely to be dropping $140 for an ounce of black truffle, I read S. Irene Virbila's column in the Los Angeles Times this week with interest. There is almost a mystical allure to the black truffle these days, and it seems any product with even a trace of it is priced through the roof. 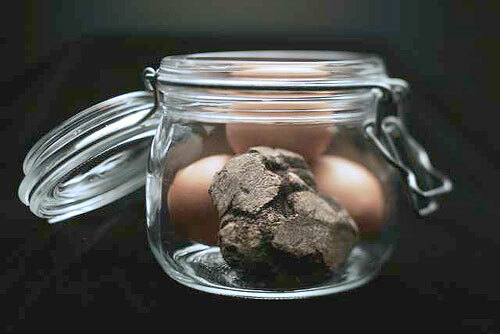 Close examination usually reveals no more than a speck of the truffle in the actual product. Virbila talks about purchasing whole truffles (also in bulk) and putting them into omelets, chicken, even a baked potato. I had no trouble at all with that. One truffle went into the scrambled eggs, which we served, Ã la Chez Panisse, with rafts of country white from La Brea Bakery, cut inch-thick and lightly toasted, then rubbed with garlic and drizzled with a little olive oil. Alongside the saffron-colored eggs we served a pretty little salad of frisÃ©e dressed in red wine vinegar and olive oil. I used some a couple of days later to fold into a baked potato Â fantastic! You can toss fresh egg noodles or tagliarini in some of the truffle butter too. The simpler the better.